Some drunk ina hawaiian shirt helped with this. If you blink at the end you'll miss the screen credit. Interests:Bad music, good art, motorcycles, and firearms. Very nice. I haven't finished the episodes yet, an emotional watch as I'm suddenly a little kid again and the old man is educating me on Frank Piasecki, Igor Sikorsky, and reminscing about the Hiller Killer, aka the Palo Alto Widow Maker. Thanks for sharing it, I wouldn't have seen it otherwise. I was talking to him on the phone recently. He was at work and a minion kept coming in to ask him questions about where some exotic material or other was stashed, intended for rotor blades or something. Impressive fellow, but we already knew that. Hans, i was lucky to meet Frank several years ago, and talk with him about his time at Platt-LePage. The best part of researching the forgotten Platt-LePage XR-1, was talking to the people who were there back in the day. Sadly, they are all pretty much gone now, I'm glad I was able to get some of their stories. I want to know where they keeping the UFOs. Well, that's some rotorcraft history in the flesh. My dad transitioned from fixed-wing to rotors in the 50's. If I remember correctly, at that time Bell Helicopters provided some training directly. He had this "paperweight" as long as I can remember, now I have it. 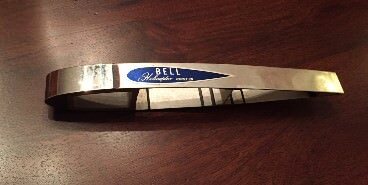 I think it's a UH-1 blade sample, not sure on that. My own little piece of history. Edited by Hans Conried, 21 November 2017 - 08:17 AM. Balancing and blade tracking must have been fun during the pioneer era. Here is L to R : Arthur Young, W. Laurence LePage, Haviland Platt, viewing one of Arthur Young's electric heli models in 1940, before Arthur young put Bell Aircraft in the helicopter business. Edited by Absinthe_1900, 21 November 2017 - 06:56 PM. If people saw film of what helicopter rotors go through in flight, they'd probably be a bit apprehensive, riding in one..
Back to The Cinema Cafe.